MUNSTER -Frankfurt an der Oder. MUNSTER, S. - Frankfurt an der Oder. Frankfurt an der Oder. - MUNSTER, S.
Title : Frankfurt an der Oder.. Date : Basel, 1552 - 1568. Size : 8.9 x 13.3 inches. / 22.5 x 33.7 cm. 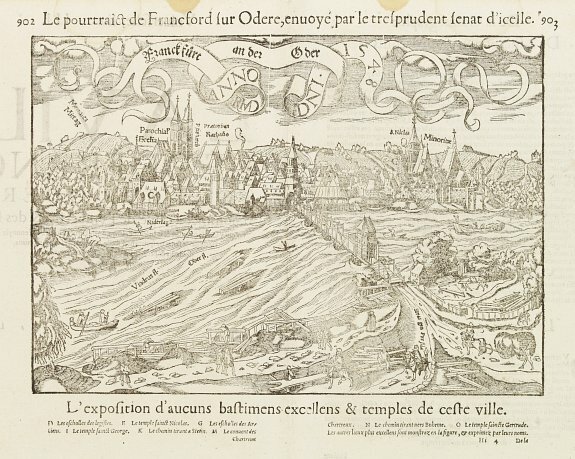 Description :Interesting woodblock view of the medieval town of Frankfurt an der Oder, in Brandenburg. It lies on the Oder river, which marks the current border between Germany and Poland. Individual landmarks and buildings are named as well as farms and other points of interest in the surrounding countryside. An elaborate title banner and crest adorn the view. With French title on top and a cartouche indicating 1549 in Roman numerals. From a French edition of Münster's Cosmographia Universalis. Condition : Wood block print with letterpress, in good condition.